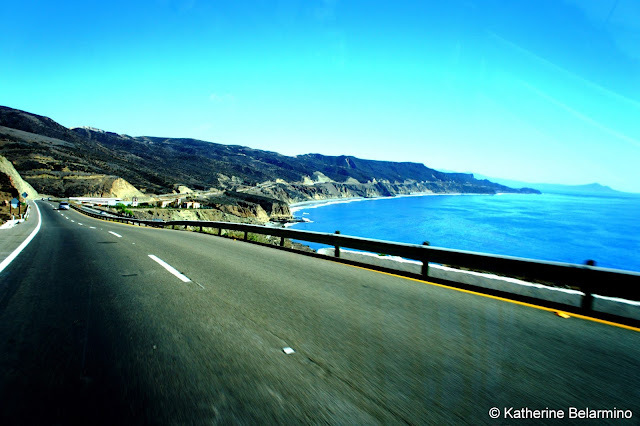 ﻿﻿It had been a few years since I crossed the California-Mexico border to enter Baja California. I’m a born and bred San Diego girl, which means in my early 20s I crossed the border numerous times (much to my mother’s chagrin). You know, because a shot of tequila is so much better when poured directly down your throat with a whistle blowing and a head shake after (not really). There were also the frequent cross-border taco runs. But as I got older, the trips into Baja dwindled, and then stopped completely. Then we started hearing travel warnings because of the drug crimes and murders occurring in border towns. 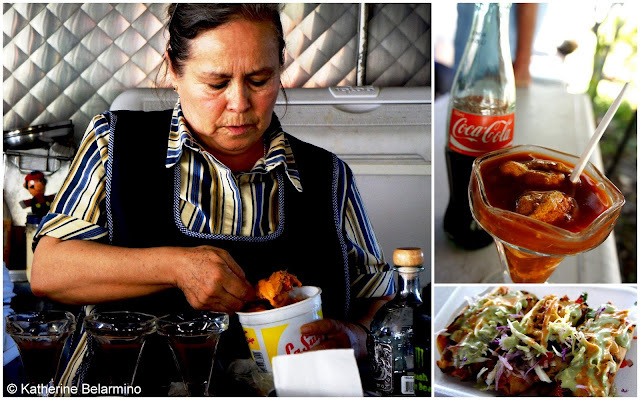 Some of those travel warnings have now been lifted, so I decided to dip my toes into the proverbial Baja waters again with a food tour with Club Tengo Hambre. 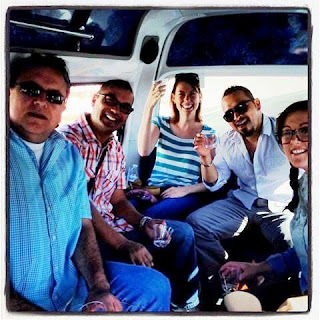 Club Tengo Hambre is a roving supper club that organizes food and wine tours in Baja California. A tour with Club Tengo Hambre appealed to me for many reasons. The groups are small, usually about ten guests. Our group had a total of four guests which included us, a gentleman from Los Angeles, and a chef from Santa Barbara. The group meets north of the border in San Ysidro and crosses together. Club Tengo Hambre uses the same driver for every tour, and his van is the best setup I have ever seen for a small group tour. Rather than having rows of seats, where every time you get into the van you cross your fingers you aren’t stuck crawling into the very back row, his van has bench seats along the sides and back with open space in the middle so everyone can sit around and talk and sip on tequila while being chauffeured to the next stop. Drinking tequila in the van. Husband and wife Antonio and Kristin Díaz de Sandi, who are also food and lifestyle bloggers, lead the tours. Antonio grew up in Tijuana while Kristin was raised in Orange County. Along with her love for Antonio came a love for all things Baja. They live in San Diego now, but are constantly crossing the border for meals that would rival anything on this side of the border at a much cheaper price. They do all the legwork for finding the best spots to take their guests to experience Baja’s cuisine. This is what appealed to me the most as I want to experience authentic Baja, but have no idea where to start. We joined Club Tengo Hambre’s Death by Uni tour. I adore sea urchin (seriously, I get cravings) so couldn’t wait to join this tour. Plus it was a full day tour where we would be visiting three different places, Popotla, Ensenada, and Tijuana, and five different eateries for a total of six uni dishes. 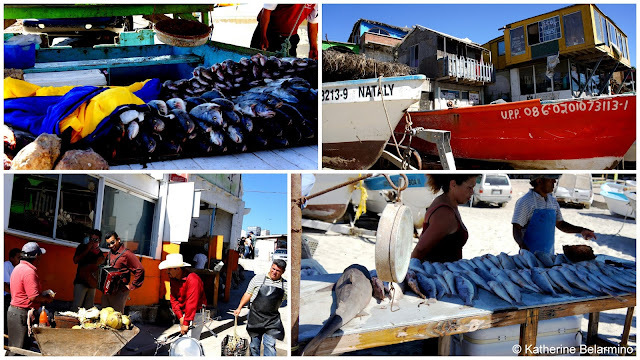 Our first stop was the small fishing village of Popotla. Popotla is next door to the Baja Film Studios and just south of Rosarito. Popotla is accessed by a dirt road that becomes a parking lot later in the day. There are a number of restaurants on the walk to and along the beach. Once you get down to the beach, there are beached boats along the entire shoreline and vendors with fish, oysters, clams, crabs and more on display on wooden tables along the sand. Antonio and Kristin told us you can actually purchase whatever seafood you want and take it to one of the restaurants where they will prepare and cook it for you. We weaved our way through the tables of fish while Antonio and Kristin found a vendor to serve us our first course, raw sea urchin. We watched the fisherman crack open the shells and spoon out the meat. He grabbed a bucket of seawater from the ocean and painstakingly cleaned the uni before dividing it equally between Styrofoam cups for us all to season with lemon and hot sauce. On our way out of Popotla I was drawn in to a table covered with clams of all shapes and sizes. We decided to add an extra course and have chocolate clams which were de-shelled and prepared right in front of us with red peppers, lime, cilantro and Clamato. Chocolate clams being prepared in Popotla fishing village with speed and skill. 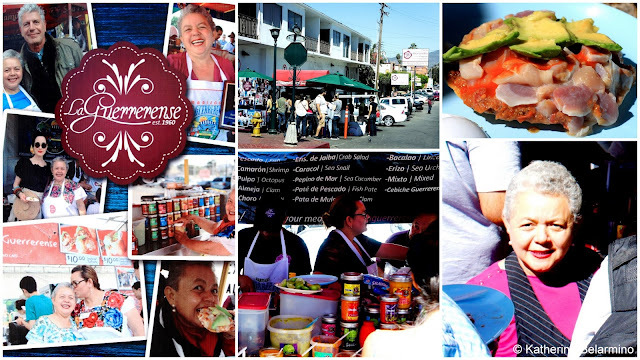 Our next stop was La Guerrerense in Ensenada, a street food stand owned by Sabina Bandera. Many celebrities have come to visit Sabina, including Anthony Bourdain and Rick Bayles. La Guerrerense offers multiple seafood dishes, but our dish of the day was the sea urchin and pismo clam tostada, which provided a pleasing contrast between the soft uni base and the chewy texture of the clams. Surprisingly, Sabina grew up in Guerrero and didn’t learn to prepare seafood until she moved to Ensenada and was taught by her in-laws. Now she creates flavorful tostadas with the freshest ingredients. Sabina is also known for her homemade, natural, organic salsas, which are displayed in mason jars. We tried an unusual salsa, Chilitos de mi Jardín, with dried chilies, peanuts, and pecans. She sells jars of her salsa, so we had to bring one home. Staying in Ensenada, we next visited Mariscos El Pizón (corner of Avenida Doctor Pedro Loyola and Guaymas, closed Wednesdays). 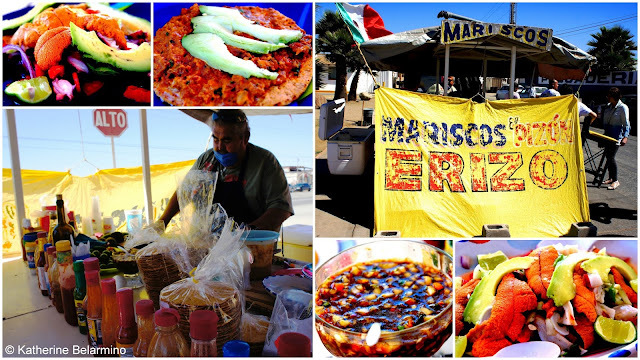 Alan Pasiano of Mariscos El Pizón creates each dish as it is ordered and only serves what is fresh that day. We started with sea urchin and geoduck clam ceviche. The second planned dish of sea urchin and yellow tail in mustard sauce wasn’t available, so instead we had sea urchin and octopus ceviche. This was my favorite dish of the day as I loved the mixture of textures of the octopus and uni. He also makes his own salsa, this one with onions and chilies and flecks of orange habañero peppers. I spent the last few years building up an immunity to habañero peppers and couldn’t get enough of the heat of his salsa, even though my nose was running and my lips were burning. We left Ensenada (after I polished off what was left on the plates because everyone else was complaining about how full they were; someone had to do it). We settled into the van for the drive along the coast back north to Tijuana, talking and drinking tequila and rubbing our full bellies. 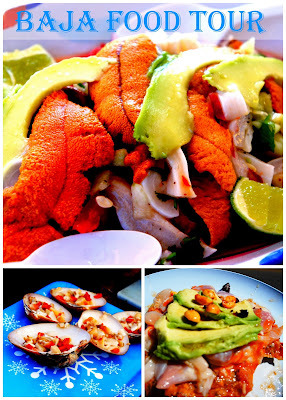 In Tijuana we visited Mariscos Ruben (corner of 8th and Quintana Roo), a Sonoran seafood truck, for sea urchin cocktail. We arrived at the food truck and made ourselves comfortable under the awning and watched Mirta Rodriguez begin to prepare our sea urchin cocktails. She made them in ice cream sundae glasses and started by mixing tomato juices and hot sauces from squeeze bottles. Then she started spooning in MOUNDS of sea urchin. As we watched her we discussed amongst ourselves how much such a large amount of uni would cost in the States. While Mirta was preparing the cocktails we also watched her husband Ruben quietly working at the mesquite grill. Mariscos Ruben is also known for their marlin taquitos, so we had to order some of those as well (this is what happens when you have a chef amongst your group). The taquitos are absolutely nothing like anything I have ever had and not even remotely similar to the taquitos on the grocery store freezer shelves. They were fluffy yet crunchy, filled with flavorful marlin, and topped with cabbage and guacamole. As if we could fit anything else into our overfilled bellies, we moved on to Javier Plascencia’s Erizo for our final dish, the “Leche de Tigre” consisting of sea urchin and a vodka shooter with quail egg. Erizo is a sit-down restaurant in what was described as the “Beverly Hills” of Tijuana. We sat around the table and sipped on our mugs of cold beer before wrapping up the day and heading back to the border. The only downside of a trip to Baja is the return border crossing. Lines can be long. 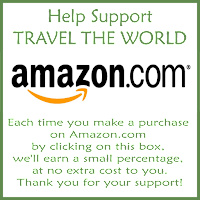 You can either stand in line to go through customs, or pay around six dollars to a company that will drive you in a van in the tourist transport lane, which can take just as long as standing in line, but at least you’re sitting. Don’t be alarmed if people come into your van while sitting in line and offer to allow you to sit in their van farther up the line for a price, or if your driver disappears for an hour or two if the line isn’t moving. The best way to avoid these long lines is to obtain a US passport card so you can use the much faster Ready Lane, which is something we will be doing. If you want to experience authentic Baja but don’t know how to do it or where to go, book a tour with Club Tengo Hambre. 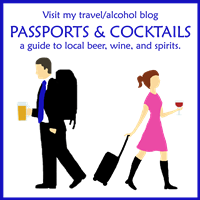 They provide many different food and wine tours of varying lengths. 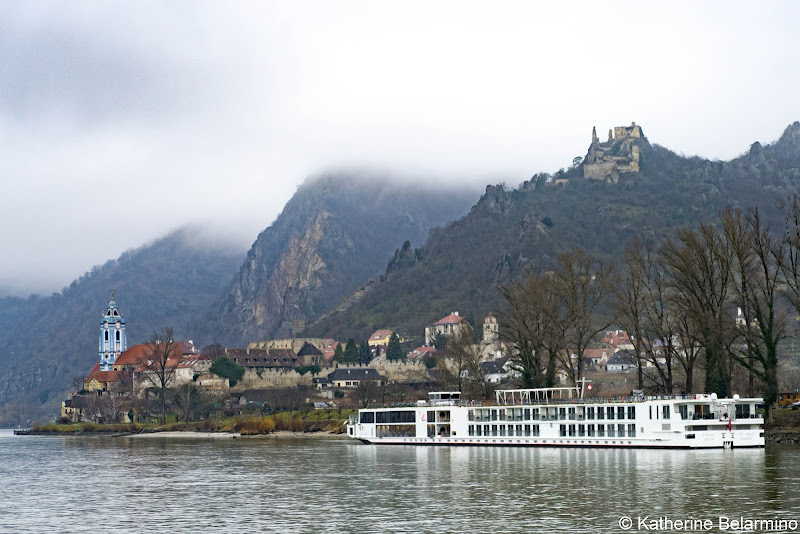 They will also provide private tours whether you’re an individual or a group. I promise you will have a fun and stress-free time.